Hostage (aka Adar Friedberg) has always had a strong passion for experimental, dark, emotive music of all styles and genres. Technically trained since adolescence and having always been in various noisy bands, in the 90′s he decided to explore the exciting new world of electronic music influenced heavily by artists/imprints such as Dom and Roland, Source Direct, No U Turn and Prototype. In order to be as detail oriented and technical with electronic music as he was with live bands, he began to study sound engineering, first in Amsterdam before eventually moving to New York City to pursue the holy trifecta: touring and playing live in Doom Metal bands by night, working as an engineer by day and somehow managing to work on subversive, deep, dark electronica wherever he could fit it in. 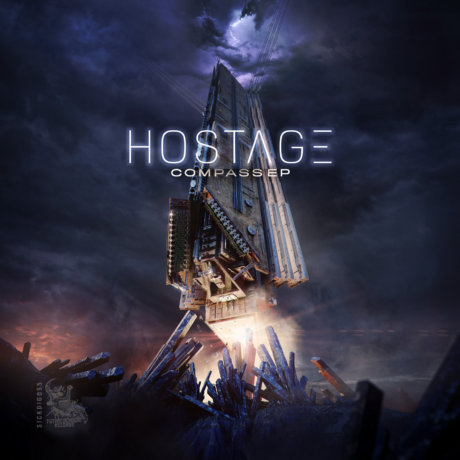 He was seduced by the terrorising new sounds of the Freak / Tech Freak / Tech Itch collective, and finally all the years of listening, learning, testing and experience seemed to manifest into a clear idea, and Hostage was born! In 2011 he released the Bamboo King Ep on T3K Recordings, instantly marking him out as “one to watch” with his relentless drums, haunting atmospheric soundscapes and unique style that, while has a classic 90′s/early 00′s nod to them, is a thoroughly modern take on it. “They Made Me Watch” is still a staple in any dark dnb soldier’s artillery. He quickly caught the eye of Freak Recordings Boss, Dylan, culminating in the release of “Chemical Ali / Latex” in 2012 followed by “Big Shadow” and the hugely popular “C’est Toi” in 2013. Anger Management snapped him up to tour Europe the same year, leaving various Therapy Sessions (London, Bristol, Portugal) and other events around the continent breathless at the sheer voracity of his sets. Once Therapy started up their extremely discerning label in 2013, the first artist they asked, perhaps why they even started the label in the first place, was Hostage. The result is the mind blowing 12″ with “Wires” (with a remix forthcoming by none other than Audio, who is a huge fan of the chunky, steppy tune) and the insidiously creeping, “Oil-Tank”. He followed this with a few other releases such as Tech Cycle’s, “Oval/Burning Inside”, as well as guest mixes on In Your Bass, Suicide Sessions and the most recent beacon of all things dark and disgusting in dnb, the Barcode Filthcast hosted by Donny *(Wires having been one of Donny’s top tracks of 2013). With all this interest across the pond, He moved in the Spring of 2013 to Tel Aviv to be closer to the music.